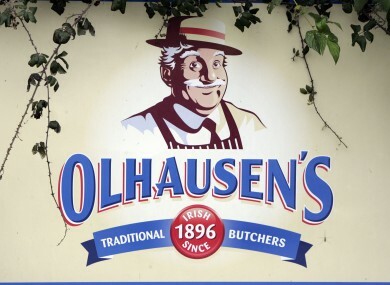 THE FAMOUS OLHAUSEN and Kearns sausages produced by the now defunct meat producer Olhausen have returned to shops after the brands were bought by a Monaghan-based meat company. Around 160 people lost their jobs last year when the sausage and rasher maker Olhausen ceased trading in October and closed its three plants in Ireland. Workers in Blanchardstown, Coolock and Monaghan received statutory redundancy pay from the Department of Social Protection as a result of the company going out of business after a deal to save some jobs could not be reached despite efforts from the trade union Siptu. After BDO’s Jim Hamilton was appointed as the receiver to the company the Olhausen brand of sausages as well as the Kearns and Byrnes brands were sold to Mallon’s, an Irish-owned meat producer based in Monaghan. The exact same products as before are now back in shops, the company says. Mallon’s sales and marketing director Ciaran Young told TheJournal.ie that exactly the same products are being produced with the same raw ingredients and seasoning. He said that sales are going well. “Actually, sales are better than expected even. People have so much loyalty to the products and people are thinking it’s brilliant that it’s back on the market. I didn’t realise how much loyalty there was to the brands,” he said. He said that jobs had been consolidated in the industry as a whole as a result of taking over the brand and said that Mallon’s had to take on extra staff to deal with the production of new products. However, former workers at Olhausen’s closed plant in Monaghan have not been recruited by Mallon’s and attempts to keep around 45 jobs at Olhausen’s Coolock site were not successful prior to the sale to Mallon’s. Colin Casserly, the Siptu organiser working with the redundant workers, said it was disappointing that a solution could not be reached to save jobs. It is believed that the machinery from the closed plants was sold to Irish Food Processors, owned by the once controversial businessman Larry Goodman, which has since rebranded as the ABP Food Group. Olhausen went into receivership last October with debts of more than €10 million to Ulster Bank. Email “Olhausen and Kearns sausages back in shops after Irish company buys brand”. Feedback on “Olhausen and Kearns sausages back in shops after Irish company buys brand”.